Philips today announced its M1X-DJ, a collaborative effort with its own sound engineers and one of the world's biggest DJs, Armin Van Buuren. We caught up with AVB after the press announcement to get his view on the new product. "DJ-ing is similar to cooking," says Dutch DJ Armin Van Buuren, who has partnered with Philips to launch the new M1X-DJ mixing dock. "It's about ideas in your head but having good equipment to make something great. On-stage DJ gear can cost up to €7000, so I wanted to bring as much technology as possible to as many people as possible". "It's about creating something closest to what I do". Priced at €399, the M1X-DJ has most features that today's digital DJ is used to such as pitch control, crossfader, four channels, two platters, cue buttons and digital beat-matching. AVB demoed a few features - looping, EQ-ing and cue-ing - that required a combination of using the hardware DJ controls and the bundled Algoriddim app that can live record and share mixes. "Ten years ago you wouldn't DJ with anything else but vinyl," he said. "I miss the sound of vinyl and playing vinyl, but there are so many advantages of playing digitally. I put all the equipment I use when DJing - EQ, FX, syncing - into this box. It has the same functionality of what I DJ with. It's really fun". Getting hands-on with the M1X-DJ, we were impressed with its power but the bass sounded a little flat in our demo room. To be fair, we only heard some generic trance. However, you can daisy-chain an unlimited amount of units together to create a bigger sound. Running on D-cell batteries, rather than rechargeable, the M1X-DJ is quoted to last for five hours at full power before needing a re-juice. AVB was quick to back up this decision: "I insisted that the box had replaceable batteries, meaning you could carry your beach parties on all night long. That was really important". The M1X-DJ clearly takes inspiration from the portable boomboxes found on New York street corners in the Eighties. Connect its strap and you can lug the entire unit around with you. 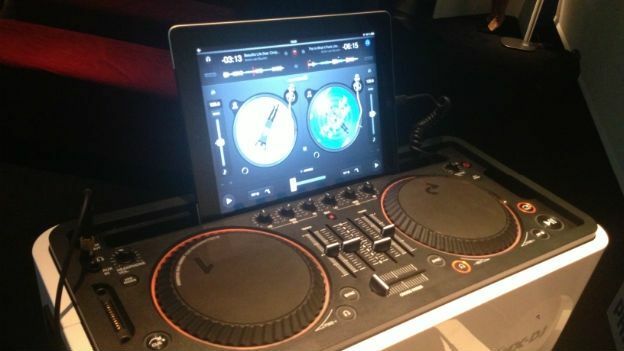 It only supports latest-generation Lightning-connector iPads (including the Mini), but away from DJ-ing, can be used as a standard Bluetooth speaker. The M1X-DJ will be available to buy in November.